Randy and Quinn running in the BAA 5k Race in 2013. 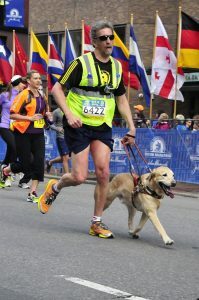 Why do I run the Boston Marathon each year? I think equally important is asking why any of us might choose to undertake anything as well as how we look at the difficult aspects of the many things we undertake. For me, a part of the reason I run this event each year is because I so well remember a time when I not only could not run a marathon, or run at all, but I could not walk or even stand. During my time in the wheelchair from June 2004 until March of 2006, I was in a very different mindset as I faced the daunting reality of life without the ability to walk. As Mr. Trimble’s quote suggests, for all the difficult realities involved in my training for this marathon or any event, it was so much more difficult for me to be immersed in the challenge of not being able to do those things many of us so often take for granted. This is why I so determinedly wish to appreciate the great fortune in being able to undertake the hard work involved for things which are meaningful to us. Certainly I’m still as prone as anyone to complain at times when in the midst of difficulty, but how quickly that turns around when I remind myself how fortunate I am to have the ability to choose the challenge and resulting rewards involved in those events. Boston in particular is very symbolic for me. The race exudes the notion of celebrating more than the elite athletes involved who will doubtless cross the finish line well before me. Boston celebrates the elite human spirit choosing to run for a cause or to overcome an experience in this event which invites such opportunities through their inclusionary options and charity options. Inclusion was not always at the heart of the Boston race day experience, but due to the hard work of many pioneers and the ultimate awareness and adjustments, is now a central theme of the Boston Athletic Association and this race. It is supported by a community who make a statewide holiday of Patriots Day in large part to ensure Marathon Monday is celebrated in grand style by millions of people. I am proud to stand as part of that community and part of the race. 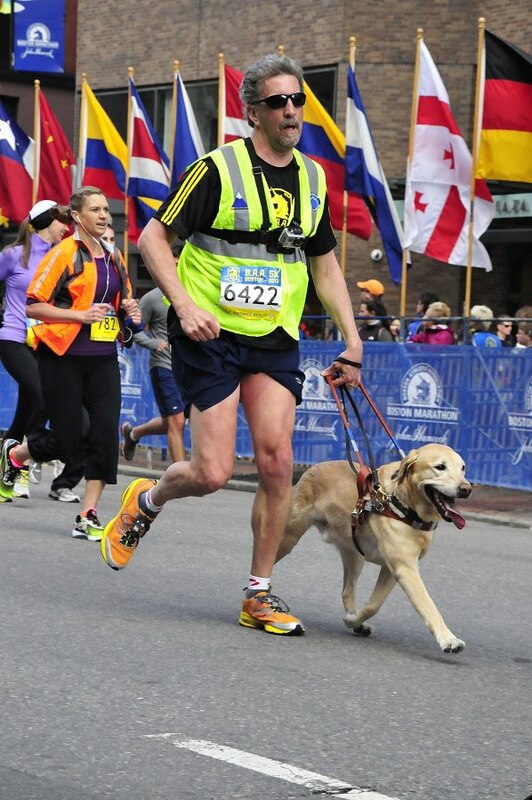 Yes, my ambition to run the Marathon began when I ran the BAA 5K guided by the Mighty Quinn. Yes, the horrific reality of the bombing the next day ultimately inspired my response to become part of a positive community by learning to run marathons and qualifying to run this race. Yet each time as I line up in Hopkinton with a friend beside me to guide me, hundreds upon hundreds of miles in training behind me, I always put my focus forward. My days of not being able to stand were left behind. I learned to stand, to step, to stride and to run. I celebrate the gift of running as well as the real commitment and toil of running with a training plan intended to bring me across the finish line on Boylston street. What I celebrate most of all, though, is my appreciation for realizing we should always celebrate the gifts of what we can accomplish and the ability to do the work necessary to bring those gifts to a worthy reality. I hope in my approaches, which rarely lead in the races, to perhaps lead a bit in example for the full appreciation of ability awareness for anyone and everyone who might lose sight of that along the way. Randy, I have heard you speak to my sixth graders for two years now and I am so inspired by your story. I tracked your running today and cheered so loud for you a little after mile 10. You smiled and waved and I cried because I am just so happy to know that you do what you love at all times. I hope to inspire people as much as you do someday. Thank you for being you!